Are you ready for Orange July 2012? It’s that time of year again – time to celebrate phenomenal fiction! Orange July is here! Orange July (and its sister month, January) are biannual events where people around the world commit to read at least one Orange Prize for Fiction winner or nominee. That’s it – just one book! 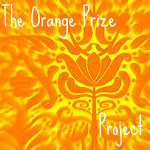 You can also learn more about Orange books on the Orange Prize Project. This blog contains readers’ reviews of Orange Prize winners and nominees. And while you’re there, consider posting your own reviews to the blog! And if you blog about Orange July 2012, please use the shiny new Orange July 2012 badge – posted on the top right of this blog post. Thanks for your help in spreading the word! 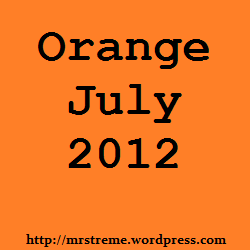 As part of the Orange July festivities, I will be hosting giveaways on my blog throughout July. I have more than 20 books to give away, including the entire 2012 short list! Giveaways will be open to everyone – no matter where you live – and you can enter to win more than once. I will post the giveaway books and rules/tips on a later blog post – be sure to subscribe to my blog so you don’t miss this big announcement! June 24, 2012 UPDATE: Here’s the link to my blog post that lists the 2012 Orange July Giveaways! Enhance your Orange July experience by participating on our Facebook page and LibraryThing group. While this is not a requirement for Orange July, most participants have fun discussing books and getting to know each other through these sites. How do I sign up for Orange July 2012? For this Orange July, I am requesting all participants sign up using the Mr. Linky widget below. Click on the Mr. Linky graphic to add your name and link. Feel free to link to your blog, LibraryThing or Goodreads profile, Facebook profile, Twitter account, etc. It can take a few minutes for your name to appear – don’t despair! Hope you enjoy Bel Canto! I have books set aside that I didn’t get to in January, and I might try for the three on this year’s shortlist that I didn’t get to. Count me in! My list is ready! Woo hoo! Hope you have a great reading month, V! I’m looking forward to it too and have a few books already planned. The Bone People, Night Watch, and The Magician’s Assistant. Loved The Night Watch and The Magician’s Assistant! Hope you like them too! I hav several books that I have put aside for “Orange in July” Home, A Crime in the Neighborhood, The Hundred Secret Senses, and Purple Hibiscus – which I won in “Orange January” – thank you very much. I’m not sure if I wil get to all of them, but we’ll see. Welcome, Dawn! Hope you enjoy Orange July! I have Memory of Love on my wishlist – must get it one day! Enjoy! Jill, can you please remove my first entry? Couldn’t figure it out. Thank you. My reading plans for Orange July include the remaining winners I have not yet read. The Road Home, The Idea of Perfection and of course The Song of Achilles and hopefully a few more. Just want to add that I loved Purple Hisbucus. the idea of perfection was a wonderful book, probably my favourite so far this year. Hope you enjoy. Count me in! Two that I hope to read in July are Home and Half of a Yellow Sun. I’m planning to read The Song of Achilles and The Road Home and more if possible! Fugitive Pieces, here I come! Originally I was planning to read from the 2012 longlist, but now I’m thinking, oh, choose another letter of the alphabet (it was “S” for Orange January), or pick a year (the early years always intrigue me), or aim for the winners or shortlisted books…*sigh* I don’t know. But something! Signed up! I am looking forward to this. I’ve just signed up – thank you for organising this! I plan to read the 2012 winner Song of Achilles. What a generous giveaway. A good excuse for me to finally read Night Circus. Orange July, Yay! I cant believe it’s the 8th of July already! Must check what was left unread on my January list. I love a challenge…and an intriguing book list. I’m in! I have also started following your blog. Grrat delivery. Great arguments. Keep upp the amazing spirit.